(Leipzig: Baumgartner’s Buchhandlung, 1839), 56. Genesis would have us believe that once upon a time there was one language and unified speech, and human society did not require translation. The story of the Tower of Babel teaches that translation was one of many labors imposed on humanity for our primordial sins— along with the sweat of our brow, pain in childbirth, the war between the sexes, wandering, and exile. A midrash in the Tanhuma offers an alternative primal scene: "When the Holy One came to give the Torah to Israel, God spoke to them in a language they knew and understood. 'I ['anokhi] am the Lord your God.' Rabbi Nehemiah said: What kind of word is 'anokhi? It is an Egyptian word. In Egypt, when a man wished to say to a friend 'I ['ani],' he said 'anokhi." Why did God translate the very first word of the Torah into Egyptian? The Israelites had forgotten Hebrew during their sojourn in Egypt. How would God speak with them? How would they understand the Torah? Translation became a precondition of revelation. Mutual understanding of the covenant was more important than a common language or holy tongue. And even in the language of the enemy, God's word is still the word of God. Perhaps the impulse to translate the Torah is as old as revelation itself, and God was the first translator. Perhaps 'anokhi, the first word of the Ten Commandments, is a secret Fremdwort within the Hebrew Bible—a trace of historical experiences that have made translation a necessary intermediary between the Jewish people and their Scripture. As is well known, the Jews not only produced translations, they became a "nation of translators," the chosen people of a translating deity. The insight has been expressed by Jewish thinkers throughout history. Deuteronomy begins with Moses setting out to "expound this teaching" to the people of Israel. Rashi interprets the Hebrew verb for expound, be'er, as "rendered in seventy languages," and be'er is the same term that Moses Mendelssohn used for the explanatory notes of his 1780 German translation of the Pentateuch, the Be'ur. Rav Nahman of Breslov also perceived the dynamic power of translation, specifically the Aramaic targum, to raise the Hebrew words of Torah to a still higher level. Franz Rosenzweig, who started out translating Judah Halevi's biblically infused Hebrew hymns into German, came to regard translation as a key to the transformative potential of Scripture, by which he meant, the Bible's unique power to transform "our errors into its truth." The Hebrew Bible never has been an antique volume for Jews. Throughout much of Jewish history, translating it was neither a scholarly, nor an assimilatory endeavor, but first and foremost a pedagogical one—a consequence of vernacularization. Yet, from the very start, translating the Torah presented an unavoidable dilemma: it forced Jewish translators to choose between the words of Torah and the sense of Torah as traditionally understood. The dilemma is noted in the Babylonian Talmud in Kiddushin 49a, where the rabbis attempt to understand what exactly is meant if someone refers to himself as a translator. "R. Yehudah said: If one translates a verse literally, he is a liar; if he adds thereto he is a blasphemer and a libeler. Then what is meant by translation? Our [authorized] translation." This may be one of the first acknowledgments of the untranslatability of Torah, or the impossibility of doing justice to Torah through translation, of navigating a path between the Scylla of literality and the Charybdis of the accepted meaning. Only the Aramaic targum, the vernacular translation in use since the Second Temple period, was granted the status of a holy translation. There is a clear logic behind another statement in the Talmud claiming that the day the Torah was translated into Greek was like the day the golden calf was built. It warns that translation's relationship to the original is potentially idolatrous, akin to a false image of the divine. A more nuanced view emerges from the prescription in B. Berakhot 8a: "Rav Huna bar Yehudah says in the name of Rabbi Ami: 'one should always complete the reading of one's weekly Torah portion with the congregation, twice from the mikra [Torah] and once from the targum [Aramaic translation].'" The practice of shnayim mikra, "twice from Torah," captures the ambivalence towards the use of translation by prohibiting the illusion of equivalence between, or equal time for, Scripture and translation. On a weekly basis, contact with Hebrew Torah must exceed contact with translation by two to one. The message is that while understanding the text is important, it is not as important as, is not a substitute for, the ritualized chanting and hearing of Torah. Knowing the contents or sense of the weekly Torah portion is not to be mistaken for an end in itself. In her doctoral thesis on the medieval translation tradition in Ashkenaz, Nehama Leibowitz writes that Ashkenazic Jews took the rabbinic prohibitions against the use of an independent translation of the Torah very seriously. The custom of "twice from Torah" persisted, along with the sanctioning of oral translations, above all, for educating children and women. In old Yiddish, two medieval genres of translation were developed for educational purposes, both of which were designed to avoid even the impression of what we modern readers take for granted, namely, that the sense of Torah can be faithfully conveyed in a pure, continuous, stand-alone Bible. Printed guides to translation were permitted insofar as they would require a living, breathing teacher to make any sense of them. The midrash about the word 'anokhi teaches that the translated Bible became a meeting place for God and the Jews in a time of radical transition. This was once again the case during the Haskalah. Richard Cohen likens the multifaceted return to the Bible to the construction of modern synagogues in the public sphere. 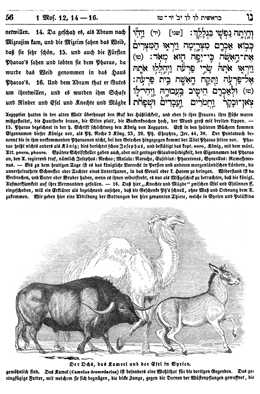 In the eighteenth and nineteenth centuries, the translated Bible opened up the domains of language, grammar, poetry, philology, history, archeology, and all areas of knowledge for German Jews. Although determined to break from the Yiddish translation tradition, in fact, German Jewish translators inherited their forerunners' pedagogical mandate, as well as their notion of the Bible as what Chava Turniansky calls an "open source." The Tsene-rene and other such books selected out verses from Scripture, then elaborated upon them with stories and homilies that related to them in an associative manner. In this way, "the door was open to many possibilities of choices of verses, to expand or contract the topic, to choose among the commentaries and draw whatever conclusions." Out of the Yiddish tradition, and also, by drawing from the Christian example, German Jewish translators updated and upgraded the image of the Jewish study Bible. An essential difference is that premodern Jewish translators boasted that they were repeating the vocabulary of their teachers, a fixed translation vocabulary referred to as khumesh-taytsh. But the modern Jewish translator was an author; he had to announce that his translation was an improvement over past versions and unique in some important respect. Of course, the source text was the same in every respect, but a new translation into German was, nevertheless, an urgent historical necessity. The break with the past was usually justified as a corrective or remedy of some kind, in light of contemporary conditions. Martin Buber made the case that a new type of Bible was needed for der Mensch von heute, but in fact, each of the translators who preceded him expressed that same sentiment in one form or another. At the same time, the translators had to create the impression of continuity between what they were doing and the vibrant classical tradition of translation going back to Moses, Ezra, the Greek Septuagint, the Aramaic targumim and Sa'adiah Gaon. This tradition was, they believed, continuous from ancient to modern times; they insisted that there was no fundamental break. To establish themselves as the next link in that chain was the litmus test of their authenticity. Put most simply, modern Jewish translators faced inordinate pressure to frame their contributions as both new and old. Translating the Bible was no punishment; nor was it just a remedy for the shortcomings of Jewish society. It became a privilege: a means of enhancing Scripture and amplifying its message. Modern translators experienced themselves as participants in a kind of torch relay, whereby the Torah was passed into their hands for them to safeguard and carry a short distance in their day and age. Still, they worried that the torch relay would be perceived as a children's game of telephone, wherein the message whispered into one's ear changes just a little bit with each new transmission. Abigail Gillman, associate professor of Hebrew, German, and Comparative Literature at Boston University, is the author of Viennese Jewish Modernism: Freud, Hofmannsthal, Beer-Hofmann and Schnitzler (Penn State University Press, 2009) and “‘Seit ein Gespräch wir sind, und hören können von einander’: Martin Buber’s Message to Postwar Germany” (NEXUS, 2014). She is completing a cultural history of German Jewish Bible translation.